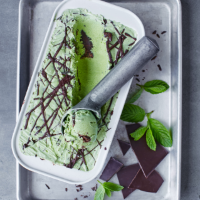 This nostalgic ice cream is brought up to date with fresh mint and dark chocolate. 1. Blanch the mint leaves in a pan of boiling water for 1 minute, until bright green. Drain, plunge into a bowl of ice-cold water for a few minutes to cool, then drain again. Pat dry on kitchen paper and set aside. 2. Pour the cream and milk into a pan with a pinch of salt and heat to just before boiling point – bubbles will start to form at the edges. Meanwhile, whisk the egg yolks and sugar in a large bowl until thick. Slowly pour the cream and milk over the egg yolks, whisking continuously, until combined. Cool for 5 minutes; rinse out the pan. Blend a few ladlefuls of the custard with the blanched mint leaves in a high-speed blender (not a food processor) until the mixture is bright green and the mint is very finely chopped. 3. Mix the minty custard back into the base, then return to the pan and place over a medium-low heat. Stir constantly with a wooden spoon or spatula, making sure to cover the entire base of the pan. After 5-8 minutes, the custard will thicken, start to feel velvety and thickly coat the back of a spoon. Quickly sieve the custard into a clean bowl, cover the surface with cling film and cool completely, then chill for 1-2 hours. 4. Churn in an ice-cream maker according to manufacturer’s instructions. When the mixture is thick and creamy and the blade almost stops, melt the chocolate in a heatproof bowl set over a pan of simmering water, or a microwave. Drizzle a little chocolate over the base of a chilled container and cover with an even layer of ice cream. Repeat, layering up the chocolate and ice cream, finishing with a final drizzle of chocolate. Cover and freeze for at least 4 hours, or preferably overnight. Remove from the freezer 5 minutes before serving, with fresh mint leaves, if liked. This recipe was first published in Fri Jul 01 16:39:23 BST 2016.